First impressions count - unless you're Ceres. Last month, the asteroid was re-classified as a dwarf planet by the International Astronomical Union (IAU), and now new images of its surface reveal a surprisingly diverse surface terrain, scientists say. "We thought Ceres had a flat surface," said Benoit Carry, from the Observatoire Paris-Meudon, "but our images show that it is rich in surface features." Carry's team has produced 360 infrared images of Ceres while observing it in rotation at the Keck observatory in Mauna Kea. The results were presented here at the Division of Planetary Sciences meeting in Pasadena, California. The subdued black and white images, which map 80% of the dwarf planet, suggest a textured surface, but not its physical properties. Dark and bright spots in the images might be crater impacts, mineral deposits or the effects of space weathering, said Mr Carry. The images are the first of an asteroid/dwarf planet using infrared and advanced adaptive optics, a technique that uses deformable mirrors on a telescope to correct the blurring caused by turbulence in Earth's atmosphere. "Imagine looking at a coin at the bottom of a pool of water," said Christophe Dumas, an astronomer from the European Southern Observatory (Eso), "that's exactly what's happening with an astronomical image; it's all distorted." Adaptive optics corrects for the distortion in real time. The success of the combined technique on Ceres recommends its use on other relatively small objects, such as the large asteroid Vesta, said Dr Dumas. 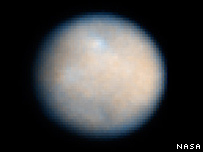 The infrared images were also used to create the first colourful 3D model of Ceres. The blue in the 3D model corresponds to the dark patches in the infrared, the yellow to the bright. The blackout at the edges is due to insufficient data at the poles. The ground-based infrared images are not as sharp as those captured in the visible wavelength by the Hubble Space Telescope in 2002-2003, but, when compared, the two sets provide a "perfect match" of surface features, said Dr Dumas. The Keck results also support Ceres' suspected oblate shape, which scientists say could be the result of as much as 25% water ice in its mantle. If so, the amount may be greater than all the fresh water on Earth. 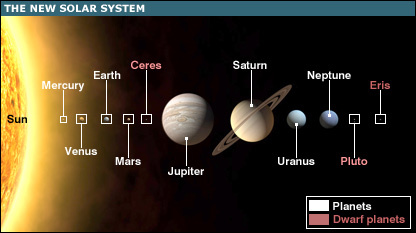 "We think Ceres still contains pristine water from when the Solar System was formed," said Dr Dumas. If there was water in the interior, it might be migrating to the surface through natural channels, he said, collecting minerals along with it, and perhaps contributing to the mottled pattern in the Keck images. The next step is to use spectral analysis to decode the chemical composition of the surface, he said. Whatever its composition, Ceres never accumulated enough of it to make planetary grade, by today's standards. It missed being a planet "by that much," said Mr Carry. But that wasn't always the case. Once the largest main-belt asteroid, now the smallest recognised dwarf planet, Ceres was originally classified as a planet when Sicilian astronomer Father Giuseppe Piazzi discovered it in 1801. The US space agency is preparing a spacecraft known as Dawn. It is set for launch next year and will use an ion engine to visit the asteroid Vesta in 2011, and Ceres in 2015.